In previous Aquaponics 101 posts, I have put forth an Aquaponics system design. This included a simple set-up of a single fish tank and one or more deep media filled grow beds. This design retains all fish waste in the system and, thereby, allows for (and requires) the mineralization of the fish waste solids in the grow beds, which also serve as bio-filters. Some of the advantages of such a design are low maintenance and operational cost, as well as a minimum number of components required to build the system. In order for this system to properly function, it must meet certain design criteria. It must have ample bio-filter volume in order to process the delivered fish waste. It must have ample water flow in order to deliver those wastes. It must have ample water aeration in order for the bacteria to process the fish waste. And, It must have ample grow bed space to grow the plants needed to uptake the produced nutrients. For a simple backyard Aquaponics system this is all that is required, as long as it is limited to low fish density, which means having about one pound of fish for every six gallons or more of bio-filter/grow bed. This number can be pushed to one pound of fish for every three gallons of bio-filter; but that borders on the edge of instability. Even if the chemistry measures in the safe range, the lowering of pH due to the nitrification process will always require constant (weekly) adjustment by adding a pH-up solution. This solution can be either Potassium Hydroxide (potash) or Calcium Hydroxide (lime). As mentioned above, the system must have ample aeration. This is necessary in order to create a Dissolved Oxygen (DO) content of 6.0 or higher. It will also help to de-gas the water. More on this below. This DO level can be difficult to achieve by just aerating the fish tank, especially if the water temperature is above 78 degrees F, because the higher water temperature drives out the Oxygen. Additional aeration can be added to the grow beds; but it adds only a small amount of DO to the system water. This is because the depth of the water in the grow beds is minimal, and the air bubbles don't spend much time in the water. Also, due to the shape of the grow beds, it is difficult to fully aerate them without multiple aeration devices spread throughout their bottoms. Again, this does add some DO to the water but at an equipment and energy cost. Adding additional system components to help improve the water quality is a common practice among commercial aquaculture and Aquaponics growers. In order to understand these added components, we must first understand what need is being addressed by adding them to the system. Water contains dissolved gasses. In addition to some oxygen in the water, it may contain excesses of Nitrogen, Hydrogen, Methane, CO2, and Hydrogen Sulfide. Some of these gasses are from the process of fish waste being broken down by the bacteria in the system. Hydrogen, for example, is released into the water when autotrophic bacteria break apart Ammonia (NH3) into Nitrogen and Hydrogen. They add Oxygen to the Nitrogen to produce Nitrite (NO2) in its first iteration process and later add more Oxygen to produce Nitrate (NO3), which is less toxic to the fish than either Ammonia or Nitrite and beneficial to the plants. The released Hydrogen is then combined with the Carbon DiOxide (CO2) in the water to produce Carbonic Acid (H2CO3), which is what causes the water's pH to lower. Carbonic acid is also formed anytime Carbon DiOxide is dissolved in water (CO2+H2O-> H2CO3). The alkaline buffers that may be present in the water initially will keep the pH high, but they will eventually be overwhelmed by the shear amount of Carbonic Acid being produced as the fish density increases when the fish grow out and are fed more food. Part of the solution to these troublesome gasses in the water is to de-gasify them in a degassing tank. This is usually a rather shallow tank, which the water flows through as air is being pumped in by way of aerators in the tank's bottom. This degassing operation also adds some aeration to the water. Before the water gets to the degassing tank, the fish waste solids must be dealt with. There are essentially two ways to deal with these solids; either remove them completely (as best as can be done) or break them down through a process known as mineralization, which is done by bacteria that are found freely suspended in the water. Often, a combination of removal of the solids and mineralization of the remaining solids are combined in a system design. Mineralization is accomplished by Heterotrophic bacteria. They, like the Autotrophic bacteria mentioned above, are Aerobic bacteria, meaning they require Oxygen to accomplish their task. Heterotrophic bacteria remain free in the water until they attach themselves to suspended organic matter, like solid fish waste and excess fish food, and convert them into dissolved solids, as well as produce Ammonia. The Ammonia is taken care of by the Autotrophic bacteria in the bio-filter, and they give us even more Nitrates. Again, Aerobic bacteria require and remove Dissolved Oxygen from the system water. The mineralization tank is much like the degassing tank in that it requires aeration to be effective. We have now added two extra components to the system, a mineralizing tank and a degassing tank. And, if we plan on using Raft, NFT (Nutrient Film Technique) or Aeroponics (the spraying of nutrient rich water onto the plant roots) instead of deep media grow beds to grow our veggies, then we will need to add another component to the system, the bio-filter. It is interesting to see how little attention is paid to the bio-filter in some of the commercial system designs I've looked at on the internet. The bio-filter contains media with lots of surface area so the Autotrophic bacteria have a place to live and do their thing of converting the Ammonia to Nitrates. The bio-filter is a container of some sort where the mineralized (or filtered) and degassed water passes through the media; and, if properly designed, aeration devices are added to help with the process and to de-gas the Hydrogen. So, why go to all of this trouble and expense in adding these components? Well, if you are building a low density backyard system, then they are not necessary. But if your system is a larger higher density one, and you want to get serious about growing large amounts of food (vegetables and fish), then improving your water quality not only makes sense, its a requirement. In a media filled grow bed, the addition of the solid fish waste can be problematic. Even though I have advocated for this being done in order to simplify a small low density backyard system, the grow bed is not the ideal place to mineralize the solid waste. It coats the grow bed media making it less usable for the autotrophic bacteria which need the media's surface for attachment. It can also coat the vegetable roots preventing them from proper uptake of nutrients. As the amount of solid waste increases, this then becomes a problem. If you are growing lettuce or other leafy greens that can be grown in a raft system, growing them in media such as expanded clay takes more time to both transplant and harvest. In a commercial operation, this added time cuts deep into what little profit margin there may be. By using a raft or other deep water culture system, the transplanting and harvesting time is greatly reduced. In order to use a raft growing system, the water must be relatively clean, which means free of solid fish waste that might interfere with the plants' uptake by coating their roots. This coating would retard their growth requiring more time and thereby adding cost to the yield. Clean water is especially necessary in Aeroponics, as the sprayers can otherwise become clogged with solid fish waste. So, how do we accomplish this water quality improvement without adding a lot of system complexity and cost? One way is to combine as many of these operations into as few components as possible. Think vertical. By using a relatively tall tank (which we refer to as a water tower), say six feet or taller, we can take all of the water from the fish tank pump (it must have enough head and flow to reach six feet or more) and pump it into the bottom of this vertical water tower and remove it near it's top. By adding aeration devices in the bottom of the tower, the air takes time to cover the distance to the tower's top, which is vented. On our test tower pictured below, there is an eight inch cap on its very top with a vent hole. We cut a larger hole in this cap and inserted a bulkhead so we could extend the height to prevent water overflow as well as provide a high vent and a place to insert the airline running to the aerators in the bottom of the tower. About eighteen inches from the tower's top, we added a bulkhead outlet (as far as we could reach into the tower from the top with the cap removed) where the water is allowed to flow from it into the grow beds. This outlet is well above the height of the grow beds and good flow has been achieved. Each grow bed has its own control valve to adjust the flow into it. 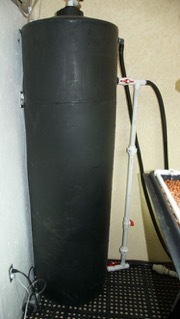 About one foot above the grow bed outlet and about six to ten inches from the tower's top is another outlet (this, along with the bottom inlet, were built into the original tank) where the excess water being pumped in and not flowing into the grow beds is allowed to overflow back into the fish tank(s). The slow upward movement of the water allows the heavier than water fish waste solids to precipitate. The air from the air stones placed in the tower's bottom keep the solids suspended. We found that there needs to be a balance in the amount of air that is pushed through the stones; for if there is too much air coming in, then the water becomes less dense and doesn't flow properly from the outlets near the tank's top causing an overflow condition, as well as raising the suspended solids too high. As it turns out, we needed a smaller air pump than we are currently using in the main fish tank. We sized the tower to contain the same amount of water that is contained in all of the media filled grow beds combined when full. This should be enough volume to mineralize most of the solid fish waste that would otherwise be going into the grow beds. The project appears to be successful. The air under pressure entering the bottom of the tower and rising degases the water. The smell from the top of the tower is an indication of this process. Distributed over forty four square feet of grow bed, the smell was not noticeable, but the smell coming from the hole in the top of the tower gives an enhanced experience. The Dissolved Oxygen in the water coming from the overflow back to the fish tanks is at 97% saturation as measured on our trusty Milwaukee DO meter. That is a measured 8.3 ppm (mg/L) out of a possible 8.5 ppm. The DO coming from the grow bed return to the fish tank is 6.5 ppm or greater. The combined DO level as measured in the fish tank is 7.5 ppm. This is quite an improvement from our previous fish tank DO. The water going to the grow beds is much cleaner than it was prior to incorporating this technology. The fish tanks are becoming even clearer than before. Prior to this addition, we were adding pH-UP weekly. Since adding the tower, the pH has stabilized at about 7.0. We attribute this to the degassing of the water. Time will tell if this trend continues. Update: After writing this we increased the food given to the fish. The pH started going down and we had to revert to adding pH-UP on a weekly basis, although not as much as before the addition of the tower. Update: After two months of operation the fish tank water has become very clear. We have stopped our weekly adding of Heterotrophic bacteria and the water continues to remain clear. This is an indication that the Heterotrophic bacteria is self sustaining. We believe this is due to the high level of dissolved oxygen and our continuous monitoring and adjustment of the pH to keep it very near 7.0. Update: November 2013, over two years of operation and everything still is performing great. Yesterday we drained the tower in order to move it into a new room we built to separate the fish tanks, filters and tower from the plant growing area as we build out our micro-farm system. We expected a lot of sludge to come out of the bottom of the tower as we drained into the field next door. To our surprise only clean water came out of the tower bottom from the beginning to the completion of the draining process. This was a welcome discovery and an indication that the mineralization process was working over the past two plus years since we incorporated the tower into our indoor growing system. Really interesting..... but I could not see your picture of the tower? Excellent infor. I am currently in process of building a system using two 275 gal totes and have been considering some of the same issues you raised here and am glad to see a workable thought out solution. I hate reinventing the wheel. I've added the Tower picture back in. delivered so painlessly and generously. versus the expense of a meter to measure DO2. said to be accurate for DO levels from 2-14mg / L.
I would be interested to know how well it works. For me, I would have to compare it the DO meter we use and like, the Milwaukee DO meter which sells for $262. I'll chip in $10 towards a test kit for your comparison. I just ordered it. I'll pay it all, not that much. Thanks for the offer though. It was the shipping that was the expensive part. Once I get it and do some test comparisons, I'll do a post.